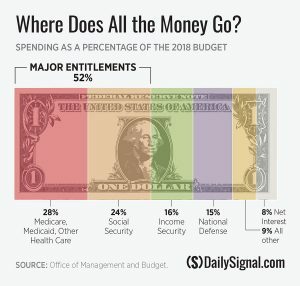 To help eliminate our budget/debt problems, the debate includes taxation, increase taxes or decrease taxes the left and right will say respectively. Both will say we have a need for a new tax code, but will not agree on a proposal for a new code. Everyone who manages a checkbook has seen budget problems before and knows how to correct it - reduce expenses and increase income. Everything else we here about this subject beyond these two facts is just noise and should be ignored. The political left and right cannot agree on how to correct this problem. Doing something is also better than doing nothing, which is what this stalemate is giving us now. The left's solution to our problem is to increase taxes on the rich to increase income. Currently the top 20% of income earners pays 80% of the federal tax burden. So do we want them to pay 100%? 110%? 120%? Maybe just write the check every year for the entire cost of government, whatever it is? Clearly this is not the solution. You have also heard that in the booming 1950's the top tax rate was 90% so decreasing taxes for growth is false. First, it is true that in the 1950's top tax rates were 90%, but no one paid it. Second, marginal tax rates are a better comparative statistic and are much higher today than in the 1950s. Third, the statement is oversimplified, incomplete and the conclusion is wrong, as proven in the 1980s. The left also consistently disparages the Bush Tax Cuts, as causing income inequality and the deficits we currently enjoy. Yet these tax policies actually reduced taxes at all income levels. Plus, when faced with a chance to end them, the left extended the cuts as a positive factor on the economy. The right wants us to reduce spending and taxes, which is also a poor solution in a recessionary economy. But the truth is we must do both (reduce expenses and increase income), we must do it now and it will not be easy. Untouchable entitlements are the problem and must be restructured. Adding another entitlement, Obamacare, to this mix just makes the problem worse. All the political hot air outside these facts is simply a distraction from the difficult but obvious answer. As to a new tax code - a must. The current tax code is over 60,000 pages long! A 2012 report estimated that it took 6.1 billion hours preparing taxes. What a waste. See the 2017 Income Tax tables for your information. You Just Can't Fix Stupid! Understanding Math in NY's Amazon deal. Trump tax reform — why don’t more Americans understand the benefits?